We need to connect the next generation to nature, and what better setting than Timberline Ranch? Some teachers have brought their students to our Maple Ridge facility for over 20 years to offer hands-on lessons in biology, the outdoors, and leadership. Timberline will provide trained staff to lead your group in horseback riding, scaling the climbing wall, or enjoying the challenge course if you’d like to make use of those facilities. Group leaders may also make use of amenities such as the archery range, team building course, swimming pool, and orienteering course, as long as they provide the proper supervision. We can provide a variety of meeting rooms for your smaller group settings, and you can check out our facilities to see how to make the best use of our space. Feel free to look at the different activities you can enjoy while at the Ranch, too! We can accommodate both large and small groups. 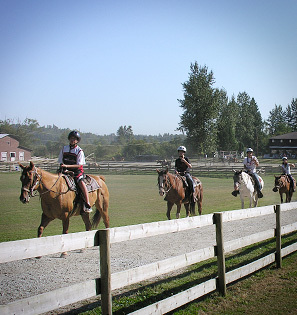 Contact the Ranch office regarding availability (604-463-9278 ext. 21 or via email). You can also download our rental contract agreement form so it’s ready to fill in and send with your booking deposit. Note: We reserve the right to book more than one group at the same time. Groups of 100 or more may be entitled to exclusive use of the facilities.